Good news, friends! It is impossible to eat too much chocolate and peanut butter. 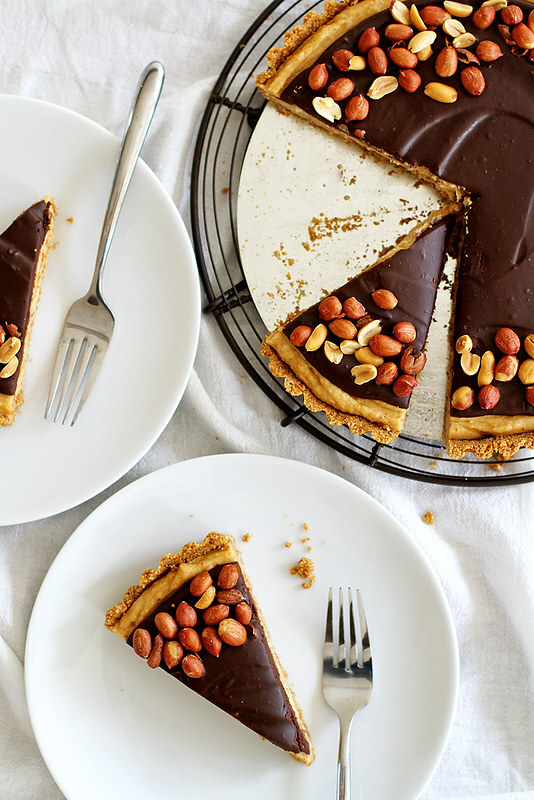 I know this because I’ve eaten obscene amounts of it in my day and I’m still here to tell you about this chocolate peanut butter pretzel tart — which is basically a giant, no-bake peanut butter cup with a pretzel/graham cracker/secret ingredient (oooooh, suspense!) crust. This tart was inspired by two things: One, my aforementioned obsession with chocolate and peanut butter, and two, a very similar tart I had at a local place called Cafe Latte. If you’ve ever been, you know they are well-known for their desserts (including that tres leches cake that I inhale every time I order it). And if you’ve never been there, well, just know that they make some amazingly delicious desserts. The last time I was there, I ordered a peanut butter tart and I kid you not when I say that was months ago and I’ve thought about it nearly every day since, it was so good. And so, last week I decided enough was enough. I needed that tart in my life again and I could not wait one more day. And in just a few hours, it was so. Except I amped up the crust a bit to make it all salty/savory/SECRET INGREDIENT-y because… well, is there any reason to justify this? I think not. If you follow along on my baking/life adventures on the Snapchat (follow me! → stephmwise), the suspense is lost on you because you already know what goes into this dessert. But if you don’t, I’ll tell you: It’s brown butter, y’all. I mixed it into the crust along with some pretzel and graham cracker crumbs and I think I will never make a graham cracker crust any other way again. In fact, I have started to put brown butter in almost anything that calls for melted butter. It’s an addiction (much like that one I have for chocolate and peanut butter. Maybe I need to seek help? Or maybe just another slice of this tart). But how can it not be, when it turns everything it goes in to something nutty, caramely, buttery and incredibly flavorful? Again, no justification necessary. Another pro to this recipe is that it’s entirely no-bake, which makes it perfect for just about any occasion — dinner parties when you need the oven to make dinner, summertime gatherings when the last thing you want to do is turn on your oven, random weeknights when your husband is working late and you need a dessert to eat in bed while you watch Scandal (ahem) — anything at all. 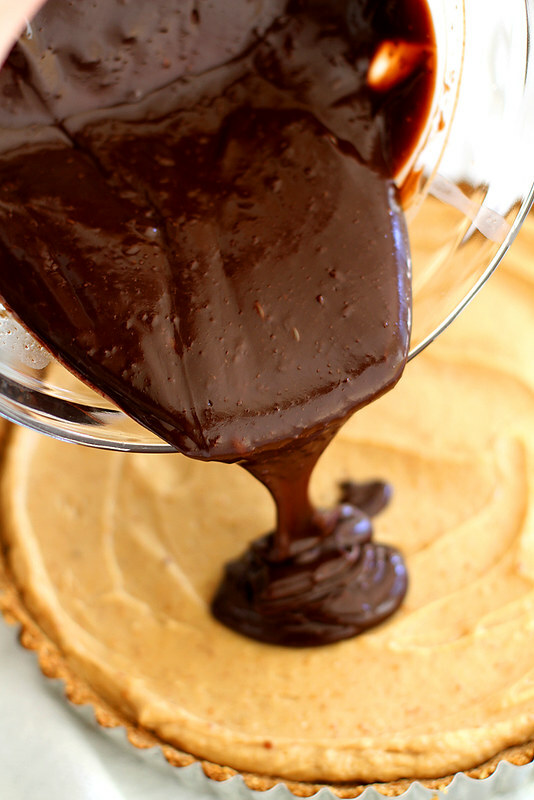 You simply make the crust, freeze it while you make the fluffy peanut butter filling, pour it into the crust and let it chill while you make the fudge-y ganache topping, spread that on top and then sprinkle it with peanuts and return it to the fridge to chill for a few more hours or overnight, if you can stand it. You can slice it up and serve it cold or at room temperature, or don’t even bother with the slicing and just go at it with a fork. Heck, maybe we don’t even need the fork — we can just eat it like the giant peanut butter cup it is. I fully endorse any and all methods of getting this tart from plate to mouth. Sooooooo this counts as breakfast, right? Pulse graham crackers and pretzels in a food processor to a very fine crumb. You should end up with about 1 1/4 cups crumbs. In a small saucepan over medium heat, melt butter. Continue to cook, stirring constantly, until butter foams and then begins to turn brown. Keep stirring until butter is a deep golden brown. In a small bowl, stir crumbs with butter until well combined. Use the bottom of a drinking glass to press mixture firmly and evenly into bottom and sides of a 9-inch tart pan with a removable bottom. Transfer pan to freezer while you prepare filling. In a large bowl or bowl of a stand mixer fitted with paddle attachment, blend cream cheese, peanut butter and sweetened condensed milk until well combined. 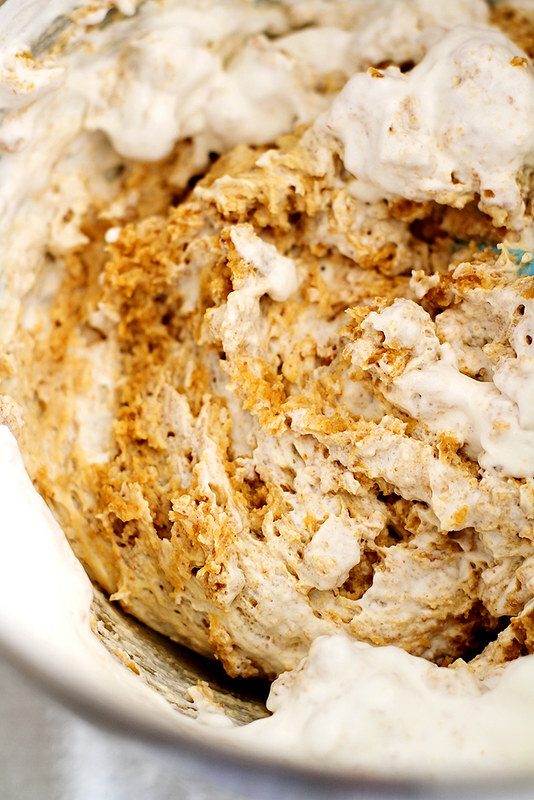 In a separate medium bowl, beat heavy cream until soft peaks form. Gently fold whipped cream into peanut butter mixture until well combined. 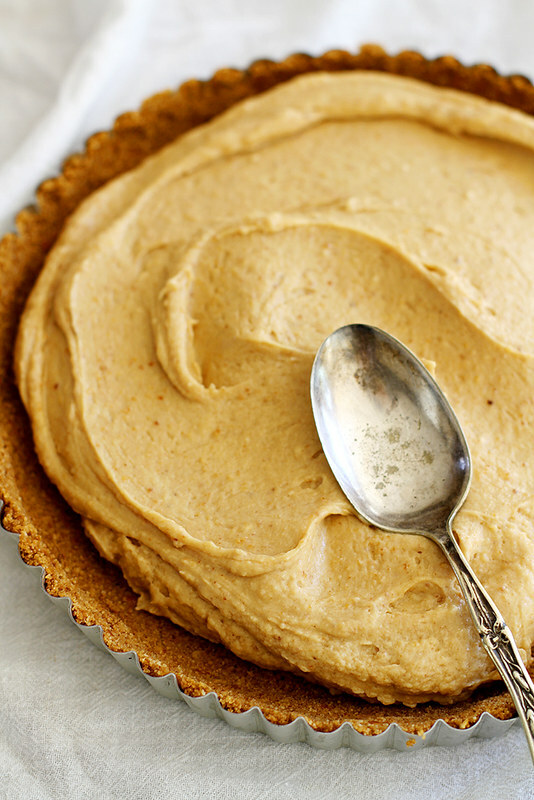 Spread peanut butter mixture evenly on top of crust in tart pan. Transfer to fridge while you prepare ganache topping. In a small saucepan, bring heavy cream to a boil. Remove from heat and pour over chocolate chips in a small bowl. Stir vigorously until smooth and glossy. Allow mixture to cool to room temperature. Use a spatula to gently spread ganache over top of tart. 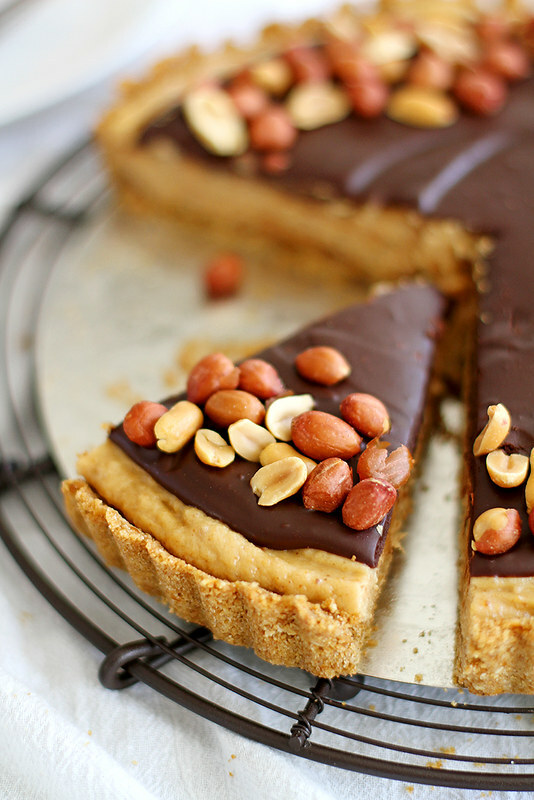 Sprinkle Spanish peanuts around edges of tart, if desired. Chill in fridge for at least 2 hours or overnight. Leftover dessert for breakfast is the only reason to get out of bed on Monday morning. Jealous! Oh boy! This has my name written all over it. And yes to brown butter in everything. What did we even do with ourselves before someone figured out to brown butter. It’s seriously the best! Today is my birthday, and I want this in my belly all day long! Oh yes – Caffe Latte has THE BEST desserts! I could go on for days about their Turtle Cake. I might need to branch out next time and try the Tres Leches. Absolutely love this tart – I’m a sucker for salty and sweet! I am just so sold on this. And yes, brown butter should be in pretty much everything. It might appear in my veggies more often than it should….! 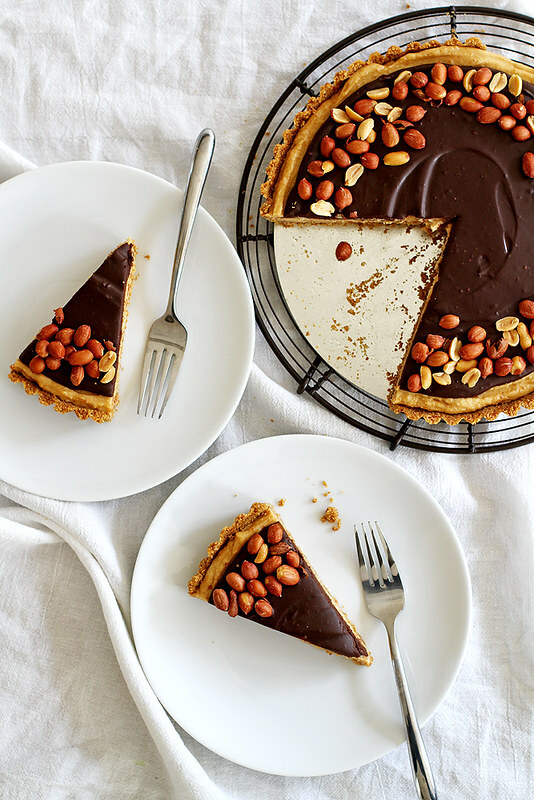 WAHOO … This tarte seems amazing and it’s a French girl who talk … so I’m not used or udge fan of peanuts butter but this … I want, I SHOULD try ! 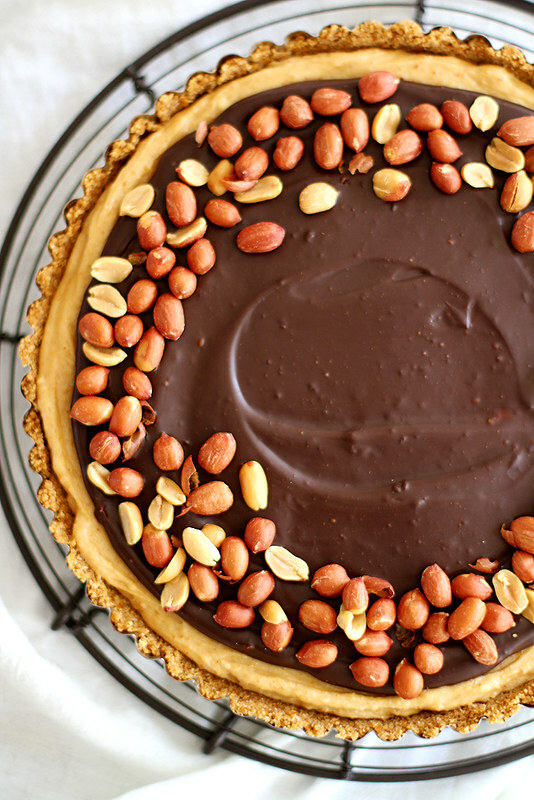 WHOAman, you’ve got it going on with this ginormous peanut butter cup situation! I love that this is a no-bake deal cause it’s already getting toasty hot in my neck of the woods, so the oven has pretty much been decomissioned until further notice. I’m all about a good graham cracker crust and those pretzels are throwing me for a real loop too! Love everything about this! We both had the same idea this week. Chocolate and peanut butter t-winning! Apparently I have been missing out by never having gone to Cafe Latte! That obviously needs to change! I can’t resist chocolate and peanut butter! If your drool-worthy pictures hadn’t sold me on this, your description of it as a giant peanut butter cup would totally win me over. Must have this in my life! This looks irresistible! The pretzel crust looks delightful, and with the hot weather months rapidly approaching, I’m always glad for no-bake desserts. This is my dream. I was totally drooling as I watched you make this on Snapchat! And I need to try it, because chocolate and peanut butter practically run through my blood. Pinned! you had me at browned butter. I have a special birthday coming up, and cakes are over rated! Words cannot describe how much I love this tart. The peanut butter filling, the chocolate ganache topping. Literally heaven in tart form. This looks INCREDIBLE! All of my no-bake dreams coming true! Jessica — Ummm go to Cafe Latte immediately. You’d love it! This is gorgeous! Annnnnnd so much fun. I love the pretzel crust! Just yesterday I was flipping through a cookbook and saw a pretzel chocolate tart. This version is different but I actually prefer it over the other one. Great photos. Stephanie this looks incredible and now I want it for dinner. Chocolate and peanut butter, always a winner! And your photos are just beautiful – your slices are perfect! This totally, absolutely counts as breakfast and I wish I had had it for my breakfast! It looks divine and I LOVE the brown butter secret-ingredient crust! This is everything I’ve ever wanted in a dessert. Hi Stephanie, this tart looks really very delicious! peanut butter, chocolate and pretzels, killer combination! This tart is just beautiful, Steph! Chocolate, peanut butter and brown butter for the win! I love that it’s no bake and the pretzel crust sounds perfect! This tart looks fantastic! Yummy! Holy gorgeous! 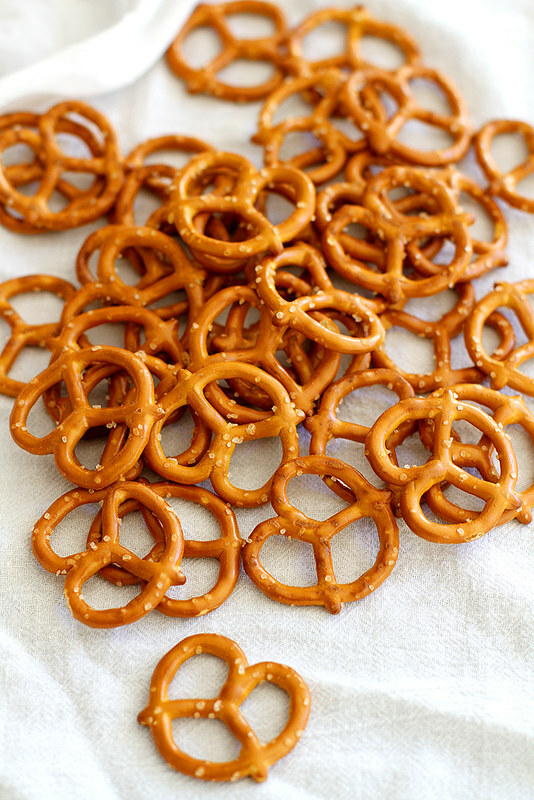 Brown butter AND peanut butter AND Pretzels? Happiness. If you say I can never have enough, I plan on devouring this entire pie myself! I don’t have a tart pan. Could this be made in 9×13 and cut into bars?? Candice — You’d probably have to double the recipe to get it to fill a 9-by-13-inch pan, so I’d suggest using a pie plate instead or a 9-inch springform pan. Peanut Butter and chocolate is the perfect combination!! What a dream!! I mean, just look at it. Oh wow. I think I would have this thing gone in about 4.8 seconds. Another fabulous creation, Stephanie! Okay, how quickly can I make this because I don’t think I can wait much more than 30 minutes, tops. Incredible!! Yep, this is pretty much the no-bake dessert all my dreams are made of 🙂 Love that you brilliantly used grahams AND pretzels in the crust. I can only imagine the glorious sweet/salty tasted divine with that peanut butter filling! That tart looks perfect. I love the combo of PB +Pretzels + Chocolate. The best! I, too, am addicted to brown butter but HOW HAVE I NEVER PUT IT IN A GRAHAM CRACKER CRUST??!! 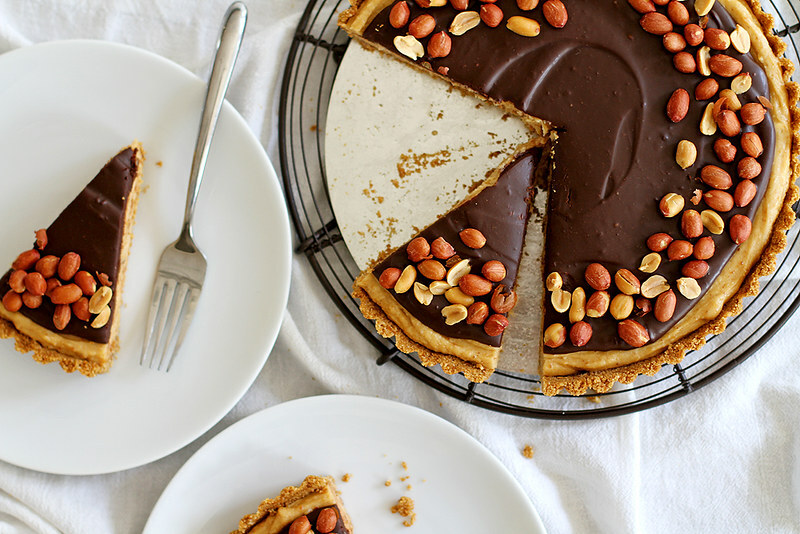 I’m 100% pinning and making this tart. I’m in looove with it! Be still my heart, this is an absolute dream!! Oh my goodness, I love all the awesome combinations you have going on here. First you have the chocolate and peanut butter but then it’s topped with salty and sweet and crunchy and smooth! So many great combinations! Stephanie, this tart is fabulous!!!! Chocolate and peanut butter is my favorite combination! This looks amazing, thanks for the post! I made this Tuesday for my friend’s visit and it was delicious. I especially liked the crust; the pretzels added a wonderful saltiness. I garnished with whip crea instead of peanuts and it’s both light and rich. Beth — I’m so glad you liked it! Whipped cream is a great addition.